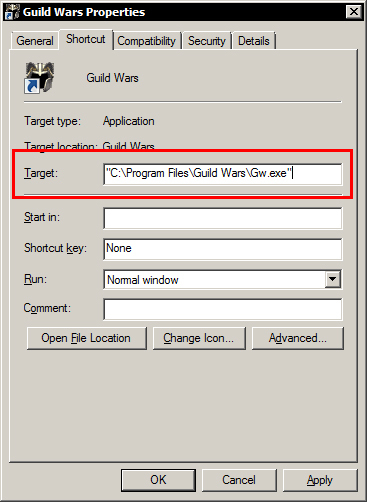 Today I’d like to talk about some really useful tricks and tricks that you can do using the Guild Wars shortcut on your desktop. The “Target” box that is outlined in red above is where we’ll be working our magic. The picture shows the default installation path of GW if you did not customize your installation. Now let’s move on to the fun. Click Apply and OK, then double click your newly edited shortcut. Once you’re in the game proceed to snap a few screenshots and then go to your screenshots folder to view your now high quality GW screenshots. We’ve all sat in front of loading screens while the game downloaded any new files or game updates. By creating a new shortcut and doing a little editing of that shortcut, you can vastly improve your load times with respect to downloads. The game has an option that will force a complete update of the game. That means every file will be downloaded whether you’ve been to an area or not. First, create a new shortcut by simply copying the current desktop shortcut and pasting it to your desktop. You should now have 2 shortcuts on your desktop for GW. Rename the copied shortcut to something like “Guild Wars Updater”, “Guild Wars –image”, etc. The –image command/option is a very useful command but be aware that on new installations of GW the update that this tool does can take hours so it is advisable to do this update over night whenever possible. Also, note that when using the –image command GW will not open up after the update is complete. This tool is meant to be an update only. Other useful command line options include the ability to add your email and password to the shortcut to allow auto-login. Unfortunately, this is VERY unsafe if anyone has access to your computer. The email and password are just plain text and can easily be read (and stolen) by knowledgeable prying eyes. The following links can be used if you’d like to do more with your desktop shortcuts or for the techies out there, the command line.